for the last two weeks the snowdrops have been emerging very gradually, and in the sunshine today I realised that more and more clumps are up through the grass. this lot have no grass to come through, so they are always first. the aconites have been around for a while, and the cold weather has preserved them. when it gets too mild they become overblown and greasy looking. I opened up the first firing for 2009 this morning. these pieces are for an installation in March, which has pushed my work in new directions. 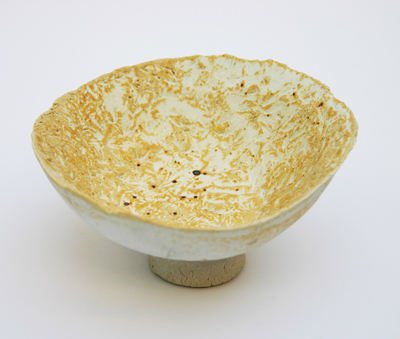 I am working with press moulds, made from existing bowl and dish shaped objects – my favourite is a wok lid. once the dish form is in the mould I have been pressing it to shape using a large very stiff round brush; then using an even stiffer brush, I found myself making some new and interesting textures. 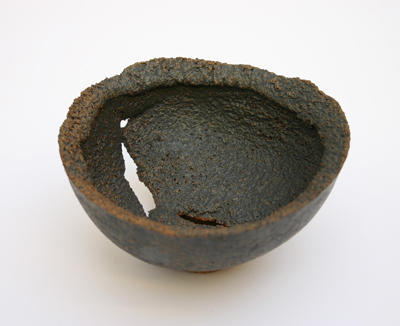 this small bowl was imprinted rather violently with a brush made of spiky stiff bristles like a yard broom . and this little bowl is prodded all over with a small brush of metal spikes. 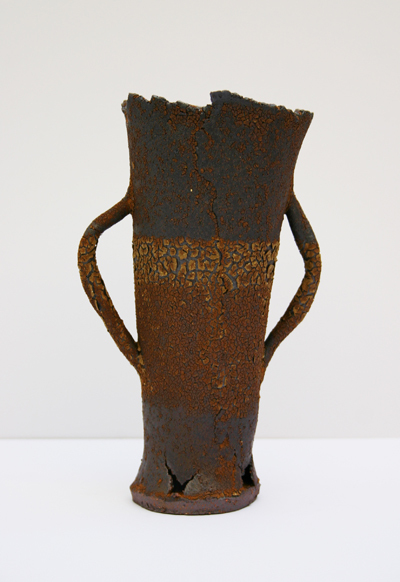 these beakers are formed around a big cone of rolled paper and put near the wood burner to set. I have been cutting up the wood from the old sheds to keep myself warm in the workshop and in the house. its a little time consuming and hard work, but helps keep me fit. A kind friend lent me a wonderful book on Gislebertius, a French twelfth century sculptor of stone carvings of saints and biblical scenes; his figures’ clothing is all fluted and whorled – very stylised but very beautiful … so that was the inspiration for the spirals on this large dish. 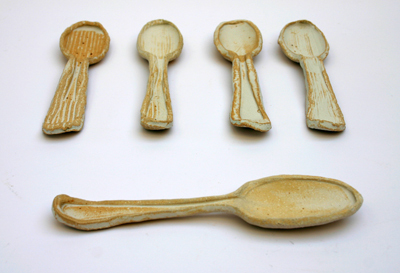 I have been making spoons, by cutting a shape in rolled out clay around an old spoon (family heirloom but scratched past redemption) and then pressing the spoon into the clay. 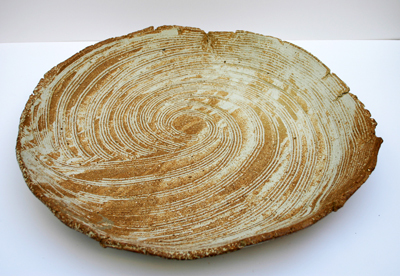 they happily fit around lots of other things in the kiln, and although they have to be carefully handled before firing, they feel remarkably solid now they are fired. as soon as I had unpacked this firing I packed a biscuit firing which will go on overnight. I have five exhibitions to work for this year. the rest of the pots are on this site. 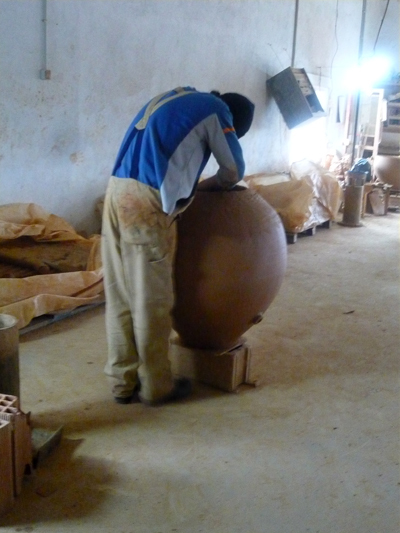 while I was in Spain I visited one of the few places where the traditional terracotta wine and oil storage jars are still made. 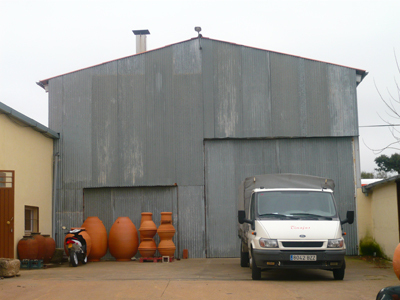 this family workshop in Torrejoncillo, north of Caceres, goes back seven generations. three are still working, father, Antonio Moreno, two sons, Antonio and Juan Carlos, and at least one grandson that I saw, but as I wasn’t introduced to the three guys making pots, one of them, the skinny one with the beanie hat, could likely be another grandson. 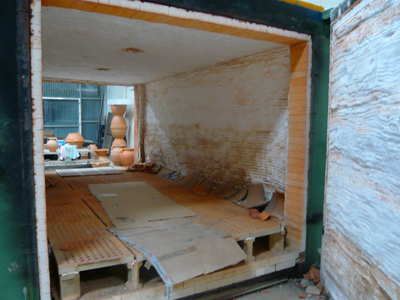 inside the big kiln shed are finished pieces, these in the foreground unfired, the pinker ones in the background are fired. some of their wares are still used for wine production and storage, but most are bought for gardens, maybe ninety percent. 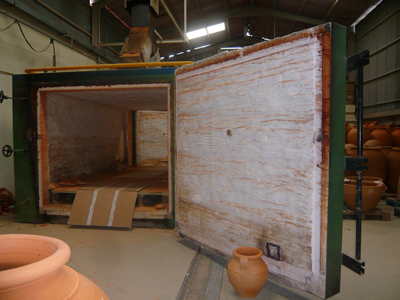 I would love to see them loading the kiln, which is rather like a container in size, oil fired. sadly the old kiln has gone the way of all things. they used to fire over twenty four hours, building up slowly with encina (ilex oak) and finishing with brushwood, or broom, which one sees growing all over the place, much like gorse in England, which used to be used as a fuel here. one can understand that twenty four hours of nursing your handmade pots with a wood firing is exhausting and nerve-racking and that firing an oil-fired kiln is much easier. it is packed from both ends and insulated with ceramic blanket folded hundreds of times. next to the huge kiln shed is an equally large building which is the workshop. there were three potters working and about fifty pots waiting for the next stage. the pots are coiled and then finished with a thrown lip, so there are many stages of working while waiting for the body of the jar to stiffen up enough for the next set of coils. mostly the pot stands on bricks and a bit of board while the potter walks round it. they dig their clay locally; its quite pale for a terracotta, sandy orange with specks of mica. I wonder whether it would take higher temperatures. they said they would sell me some, and I was not thinking ahead, or I would have got some then and there to try out. it is certainly a nice plastic clay with plenty of stiffness, looks easy to use. 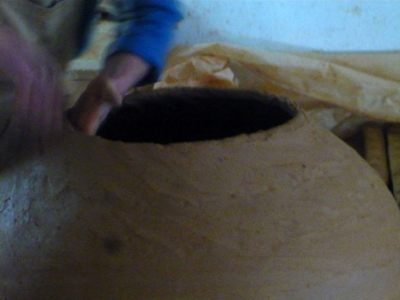 they also make bread ovens, their own invention, basically a round bellied pot cut in half horizontally to make a lid. these are very popular and they make a lot of them. Pippa and Manfred have one, and it is extremely efficient. Christmas turkey was cooked in it. this is one being made. 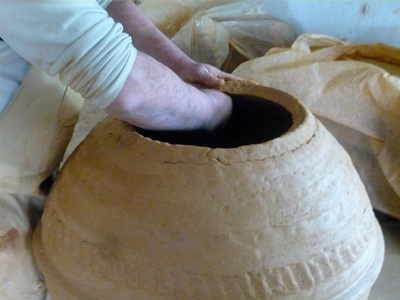 the jars are then put on a low wheel� for the lip. they are very accurately made or spinning them like this would be dangerous to the pot. 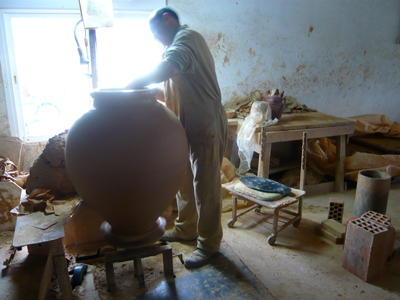 you can see a paddle on the low trolley behind the tinajero, the potter or jar-maker. the pots are paddled into shape, using the palm of the hand inside the pot wall to support it. 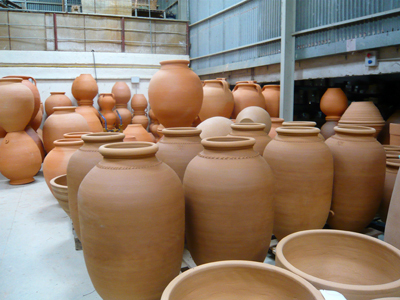 almost the same process as is used to make large jars in the far East, and is used by Svend Bayer in Devon. 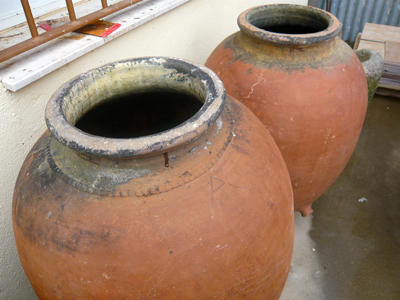 they have some old pots for sale as well; the black stain is from pine resin painted inside to make them non-porous. there are three villages near my house which were also centres for tinaja making. in Arroyomolinos they specialised in the tall straight sided conos. 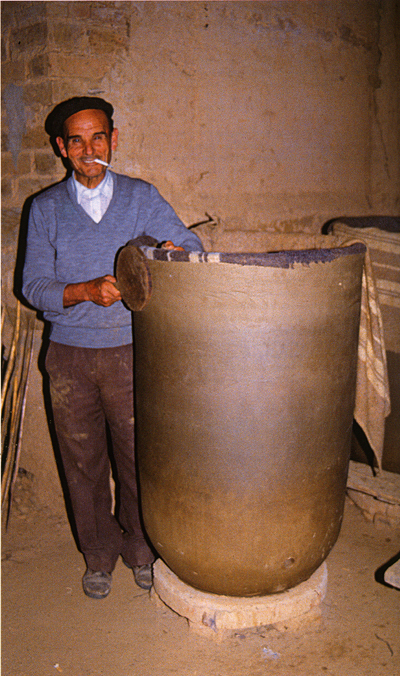 this image is from the book I bought from the potters, la tinajer�a tradicional en la c�ramica espa�ola, of Manuel Jim�nez, tinajero of Arroyomlinos, paleteando (paddling) un cono, a photograph taken in 1989.
presumably there must be clay in these villages too, as I would have thought the main requirement for the location of a pottery will be the availability of a suitable clay, although a local need for wine and oil jars might be a criteria; there is plenty of oil and wine production around this part of Extremadura. 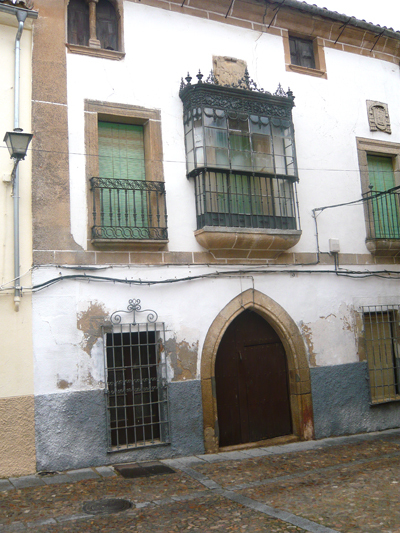 we went afterwards to the nearby town of Coria for lunch. in August it has a bull run through the streets and a bullfight in the main plaza. apart from that it is rather pretty. a few days after Christmas we had an expedition to the local visigoth basilica. it’s just above Alcuescar, and is very much conserved and messed about, with a hideous visitor centre. the rainy afternoon we were there it was closed and deserted, which was good, except that we couldn’t get into the basilica itself. an architect has unfortunately been let loose on this building, and marked their intrusion with white and grey marble and other new materials. the white marble is curiously reminiscent of a public lavatory. raindrops on the lens make the carving on the capital difficult to see, but it is Roman. a nice brick arch above the doorway opposite. the Visigoths came from the southwest of Gaul and replaced the Romans in Spain in the fifth century, but kept most Roman institutions in place. they converted to Christianity in the late sixth century, so I presume this basilica must be sixth to seventh century. they were driven out by the Moors in the eighth century. we walked up the road afterwards. the hillsides above here are mostly dehesa, full of cows – and bulls – and pigs, creatures a little intimidating to walk amongst especially with dogs, so we stayed on the road and found ourselves amongst planted woodland of pine and eucalyptus. climbing higher the only view was towards the sierra de Montanchez. the road is lined with cistus, a scented resiny shrub, which leaves a pleasant residue on your fingers, like gum arabic. after the rain there were in fact magnificent views in the Montanchez and Arroyomolinas direction. my last day of Extremadura winter, unless you count the first part of the journey tomorrow, through the grim highlands of rock and broom up to Placencia, the edge of the Gredos mountains and the high cold plains of old Castille and Leon to Burgos � where it may be snowing – and then to the Basque country and the Atlantic coast of France. here it has rained most of the night, as it did the night before, and the birds are singing. this must be the spring feeling to them, damp and soft. there is a thrush singing gloriously in the encinas at the bottom of the finca. but as it is Saturday, the hunters are out; they started shooting early this morning before dawn. I went out onto the porch to get some firewood first thing and� heard the eagle owl making his resonant low hooh . I heard him last night when I went to bed and I think I may have heard the female, a higher harsh two syllable call. they live in the crags and ledges high up in the sierra, and they are suspected of foul play in the disappearance of at least one small puppy and several kittens. young animals have to be kept under close supervision at dusk. mostly I see and hear a pair of ravens, resident somewhere in the rocks above the house. I am very much hoping that when I come back in April there will be some bird watchers staying who can identify or confirm identifications of birds for me. I am pretty sure I have several wood larks around the place � like a lark with a crest, but a shorter tail and a big cream fluffy chest, with much more striped feathering in browns and creams and a definite cream streak above the eye. they hop about and peck in front of the porch. I haven�t seen the hoopoe since the first few days; I suspect the presence of the dogs has made them shy. a troop of cranes flew over this morning; I heard their weird trumpeting calls, and came out to see perhaps fourteen flying south in a vee formation. when I come back the finca will have been ploughed and harrowed. that should mean lots of spring flowers; it will be done in early March. the soil is sandy and like concrete, it needs air in it. now there are large areas where only stonewort and moss can grow. 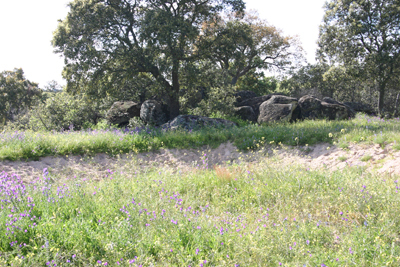 of course it has suffered from the bulldozer when a large amount of earth was extracted to make up the camino, and from the builders, including machines when the site was first cleared and opened. and maybe I will be able to get the wooden gate made for the entrada. the carpenters had the measurements over two years ago. So many promises for next time. this is a two and a half hour walk from my house, a circular walk which five of us and three and a half dogs walked on the day after Christmas. The half dog is one of the Al Manzil Weimerana puppies; given a few rests and a cuddle or two she managed very well. Manfred and I started out from Al Manzil, walking around the edge of the sierra to Arroyomolinas (the arroyo, the valley, of the mills) which is a very pretty walk in itself, mostly next to rough shooting territory � coto desportivo de caza, say the warning notices � on the hillside, in between one or three pretty fincas of grazing cattle, bells clonking away, and cork oaks; on the other side several flat olive groves, silver leafed seas of trees in rows, all the same height, the� earth bare except for a few fallen olives. it was chilly and mist still hung between Arroyomolinas and Alcuescar. the other three arrived by car at the bottom of the Garganta (throat, ravine, though ravine hardly does it justice) and we set off uphill between two spurs of the Sierra, covered with oaks and the occasional little abandoned plot of bright green grass and orange trees in favoured spots with water. the watermills driven by the Garganta stream are based on the Roman pattern, with a narrow culvert for the millstream on top of a high stone built construction. there is a long well-like drop onto the water wheel, long since rotted away in this valley. there has been some rather heavy handed reconstruction, rather than conservation, using unsympathetic materials like the modern terracotta tiles visible on the roof of the adjoining building. 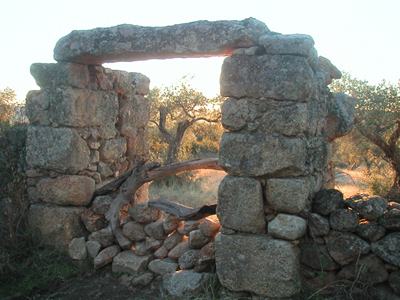 otherwise the stonework blends into the rocky background of dry stone wall and granite boulder. the path marches along the side of the valley, rising pretty smartly, and soon one begins to feel as if one is about to arrive at the top. this is deceptive though, there is another half an hour, at least, of steep path from this point. the bones of the hill; jointed granite terrace and cliff and tumbled peaks. Even a turreted fortress appears where more resistant rock has stubbornly remained. one looks back at a foreshortened view of mill and rocky landscape. several more stiff turns up the stone paved path and one arrives at the top, the flat and fertile heights of olive groves. shady with encinas in places and in others between old coppice of casta�a (sweet chestnut) which reminds of Sussex woodland. in Montanchez coffees and beers in the sun at the plaza, and then the steep downhill walk down through the town and the old mule camino back to the house. three hours in all, in refreshing cool air and bright sunshine. Manfred made an epic ride from Al Manzil via Arroyomolinas and the the garganta to Montanchez a few years ago on his locally bred Hispa�ola/Arab � ish little horse, Ali, galloping all the way on a loose rein, jumping and dodging boulders, the horse completely at his own speed, in forty five minutes from home to the Plaza del Toros at the top of Montanchez.